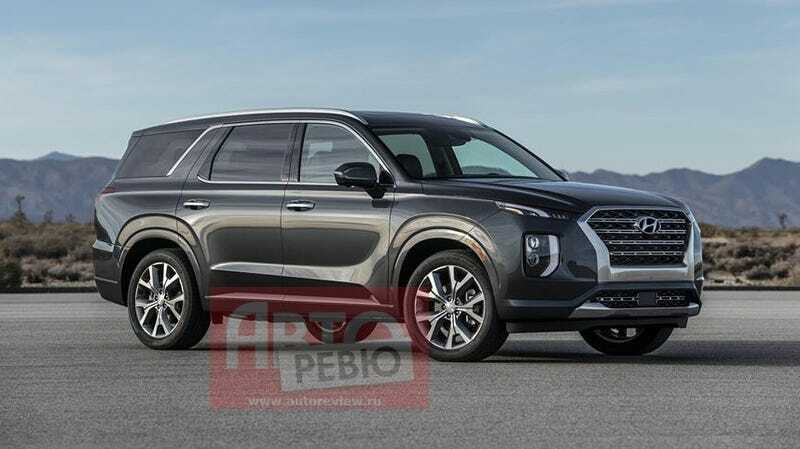 The 2020 Hyundai Palisade, maybe. Crossovers and SUVs dominate the car world now, bloating lineups like the first meal on a long-awaited vacation. But one of the few places it’s still acceptable to say a company lacks in big, bulky vehicles is with Hyundai and the eight-passenger SUV—a problem that’ll be solved with the 2020 Hyundai Palisade. Hyundai plans to debut the Palisade at the Los Angeles Auto Show in two weeks before it goes on sale in mid 2019, as cars labeled with the following year often do. But Russian website Auto Review might have beat the company to the big surprise: The site posted a photo of what it claims to be the Palisade Saturday, and it sure does fit the typical manufacturer photo style. The Auto Review story talked mainly about the SUV, not mentioning this was a potential early reveal or where the author got the photo. But it did say a lot of things we already know, like how Hyundai’s grand, eight-seat plan to appeal to upper-middle-class families with kids who are all in three sports and get better grades than you ever did in school is reminiscent of the Hyundai Grandmaster SUV concept from earlier this year. The full-size SUV is a big void for Hyundai globally, with its seat counts in passenger cars currently topping out at seven. The Palisade, if this is it, looks surprisingly better the Grandmaster concept did. That’s usually not the case with concept and production cars. The Hyundai Grandmaster concept at the Busan International Motor Show. It’s hard to deny that “bold exterior” claim, though, if this is the actual SUV. Even without interior photos to look at, the Palisade fits right in with the other giant, eight-seater SUVs that scream “We have a 3,000-square-foot house and make a comfortable-enough income to take our children and their friends skiing every year” without having to say anything at all. In other words, it looks like an automatic competitor in the luxury SUV segment, which was surely the goal. As for whether this is the Palisade, Carscoops described the Auto Review post as “what looks like a classic case of breaking the news embargo”—an agreement where news is given early on the condition that the information in it won’t be shared until a certain time. Jalopnik doesn’t get embargoes due to our policy not to honor them, so we wouldn’t know if the photo were under embargo. Some searching around didn’t give any more concrete answers on where the photo might have come from or if it might just be a render, and Hyundai would not confirm or deny the photo on the website when asked about it by Jalopnik. But if this is the car that shows up at the LA Auto Show in a couple of weeks, good on Hyundai. It’s not another crossover simply to toss a new design at the crossover-crazed masses, and it’s not some attempt to make an SUV into a sports car. This is an SUV designed to slot into its market naturally and not make a scene, which makes it the perfect candidate to carry middle-class families to their annual ski trips when it comes on the market next year.